Home Book The Book is Published! “How long did it take?” a client recently asked me. I sent the first draft to the publisher in June 2018. I sent the first draft to my editor in May 2017. The book is a compilation, with some updates and transitions, of columns I wrote for two local newspapers. I wrote my first newspaper column on California native plants in 2007. I began a career as a landscape designer in Tulare County, specializing in California native plants, in 2005. I began being interested in California native plants sometime in the late 1980’s while living in Southern California. I became a gardener when I was about three or four years old, back in the early 1960’s. In person at the Springville Farmers Market, February 2 in downtown Springville 9 a.m. – 1 p.m. In person at the Visalia Springfest Home and Patio show at the Visalia Convention Center February 8-10. I will be speaking at 2 p.m. Sunday, Feb. 9. 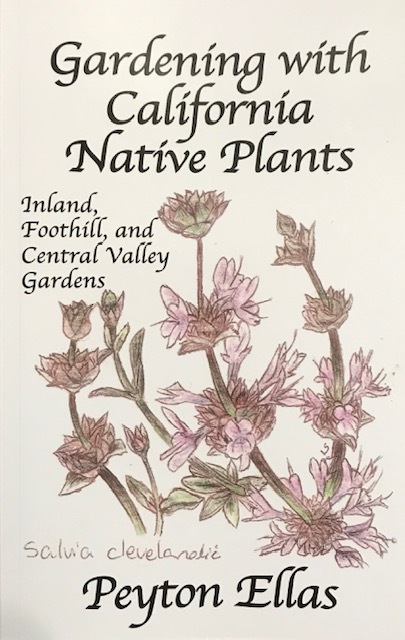 Books will be on sale at the UCCE Master Gardener’s booth throughout the Springfest show. It’s also available on the publisher website, and of course on Amazon. Yes, there are Kindle and Nook editions. I’m working on getting books at some local retailers. I’ll let you know. This is my first published book. I hope you find it useful, entertaining and inspiring. California native plants, drought tolerant, gardening in California, low maintenance, low-water use. Bookmark.